This cotton dishcloth features openwork stripes crocheted using a combination of basic stitches. The finishing touch is a lacy picot-stitch edging. Yarn: You will need approximately 4 ounces of worsted weight kitchen cotton yarn. 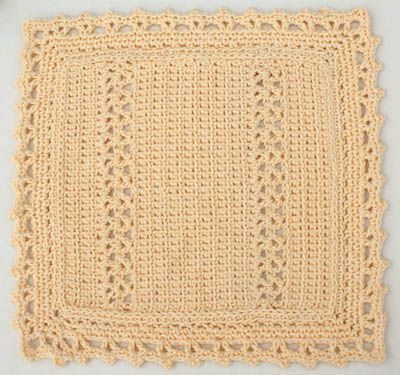 The example was crocheted using Lily's Original Sugar 'n Cream yarn in the cream color. This yarn is available in many different colors, so choose one that complements your kitchen. Feel free to substitute another worsted weight cotton yarn if you prefer. Crochet Hook: size H / 8 (5.00 mm.) or size needed to obtain the correct gauge. When the dishcloth is laid flat, it measures 14.5" high by 14" wide including the edging. Without the edging, it measures 10.5" high by 10" wide. 15 sc sts and 13 rows = 4"
Tip: Gauge is not critical for this project; it's no problem if your dishcloth turns out slightly larger or smaller than the example. It's still a good idea to check your gauge, but don't waste time ripping out stitches unless it's way off. It is helpful to crochet the starting chain using a hook that is one size larger than the hook you plan to use for the rest of the project. If you do not switch crochet hooks, be sure to crochet your starting chain loosely. Work sc stitches in front loops unless directed otherwise. 1 dc in next st. Skip next 2 sts. (In following st: dc, ch 1, dc. Skip 2 sts.) Repeat the sequence inside the parentheses 10 more times for a total of 11 times. Work 1 more dc in each of the last 2 sts. Row 8: Ch 3, turn. 1 dc in next st.
Repeat the sequence inside the parentheses 10 more times for a total of 11 times. Row 9: ch 2, turn. Ch 1 in 1st dc st from previous row. The rest of this row will also be worked in sc. However, instead of placing your hook in the front loop of each stitch, you will insert your hook inside the spaces formed by the openwork pattern in the previous row. For example, to form the first sc in the row, insert your hook in between the last 2 dc stitches crocheted in the previous row. To form the next 2 sc stitches after that, insert your hook into the space formed by the ch stitch in the previous row. Continue working in this manner the whole way across the row, making 1 sc in each space formed between dc stitches and 2 scs in each ch 1 space. At the end of the row, sc in the last dc and then work 1 more sc in the last ch st of the turning chain. 36 sc total. Rows 10 – 24: ch 2, turn. Work entire row in sc. Row 25: Repeat row 7. Row 27: Repeat row 9. Rows 28 – 32: ch 2, turn. Work entire row in sc. You now have a functional dishcloth. The edging is optional. If you choose not to crochet the edging, finish off and weave in your ends. If you plan to crochet the edging, do not finish off yet. Instead of weaving in the ends, you can hide them by working overtop of them as you crochet the edging. Count Your Stitches. When working rows of single crochet, it is easy to accidentally gain or lose stitches. Counting each stitch will help you to ensure that your dishcloth turns out square as intended. If your count is off, go back and fix it before crocheting the next row. Don't Stress About Uneven Sides. Even if you follow the pattern exactly, the sides of your dishcloth might turn out uneven. Don't worry about this. It takes practice to crochet nice neat sides; if you keep practicing, you'll get to the point where your sides are always consistent. In the meantime, this dishcloth's edging is designed to hide imperfections. Assuming you don't gain or lose any stitches, the uneven spots on the sides of the dishcloth will be hidden under your edging.